‘I want to dance around our successes, our joyful achievements – it is so easy to forget what we are creating and be overwhelmed by all the challenges around us.’ When spoken by one of the partners, it resonated with many in the GRLI meeting. Looking to develop the next generation of Globally Responsible Leadership is no easy task – there are no silver arrows, no single solutions. There are inspiring steps, there are examples of progress and development, there are relationships that are making a difference. We are in a moving system that is ever shifting. We are a network that manages to offer both psychological safety and openness of belonging – at times this impacts on pace, but in a network it’s not possible to have all three and I think we’ve chosen a good blend. Wonderful to celebrate and through recharging in the company of each other to embrace all that still needs to be developed, raged against and prototyped – we remain committed to moving the needle. 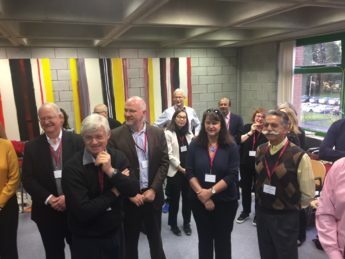 Nick Ellerby is attending the Globally Responsible Leadership Initiative‘s All Gathering Momentum (AGM) at Kemmy Business School, University of Limerick, this week. The 2016 AGM explores the theme “Common Good, Common Ground” using the idea of place as a unifying and dividing concept.